SharePoint is huge. While it has its’ moments of frustration, most every business depends on SharePoint in one form – SharePoint Online, SharePoint 2013, SharePoint 2016 – or another. SharePoint has use cases for businesses of all sizes. Most organizations depend on the content and sharing within SharePoint to function. When this is the case, SharePoint must be monitored because when SharePoint is slow, not responding, or in-accessible your end-users won’t be able to get their work done. In the February 2016 Gartner report “Four Steps to Remedy SharePoint Online Performance for a Global Company“, research director Kyle Davis advises deploying a solution to monitor SharePoint Online. More than 80% of all Fortune 500 companies use SharePoint in some capacity. In 2015, SharePoint usage grew an average of 20,000 new users every day. SharePoint was worth about $1.9 billion in 2009. It’s value in 2015? $6.44 billion. CloudReady’s SharePoint and OneDrive Sensors provide complete coverage for monitoring SharePoint, SharePoint Online and OneDrive for Office 365. Monitor SharePoint end-to-end including critical interactions with Single Sign-On (SSO) like Azure AD, Active Directory Federation Services (ADFS) and cloud-based SSO vendors like Okta, OneLogin, Ping and more. Proactive monitoring as opposed to passive monitoring. Passive monitoring or Real User Monitoring (RUM) doesn’t inform you of an issue until a user experiences the problem first. 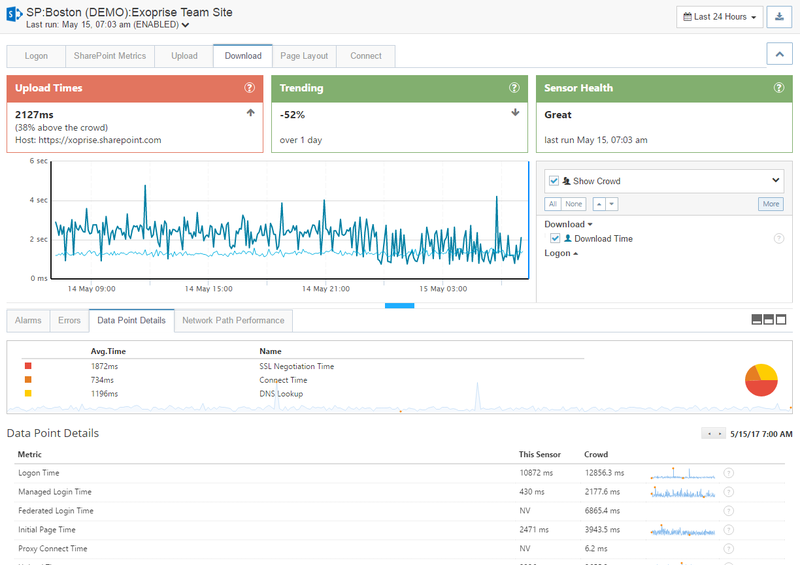 Slow SharePoint pages, outages and overloaded web servers can go undetected without Active Monitoring like CloudReady which tells you about a problem BEFORE your end-users complain. 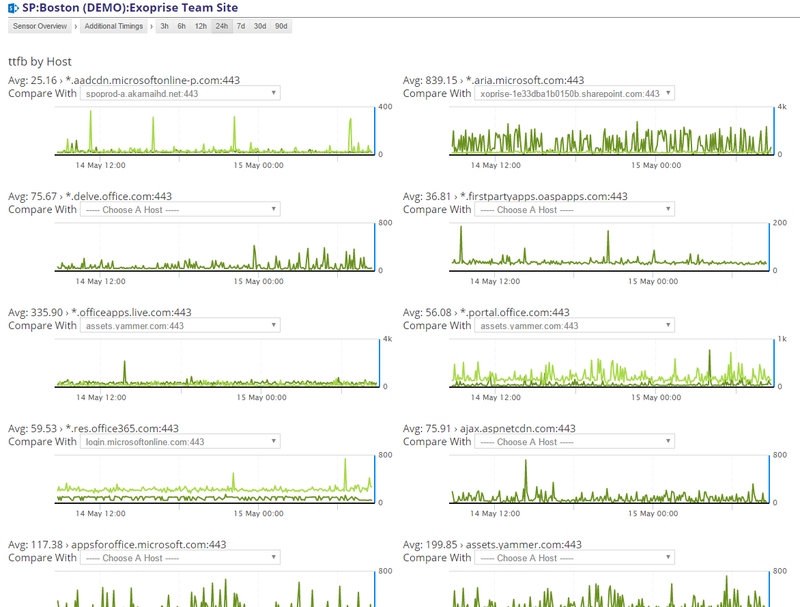 Cross-server diagnostics are critical with SharePoint Monitoring. Instrumenting and correlating metrics that span multiple servers, domains and DMZ’s is extremely difficult. It makes detecting a slow server, route or slower CDN nearly impossible. CloudReady sensors capture the end-to-end user experience interacting with multiple servers across the different boundaries for complete visibility. 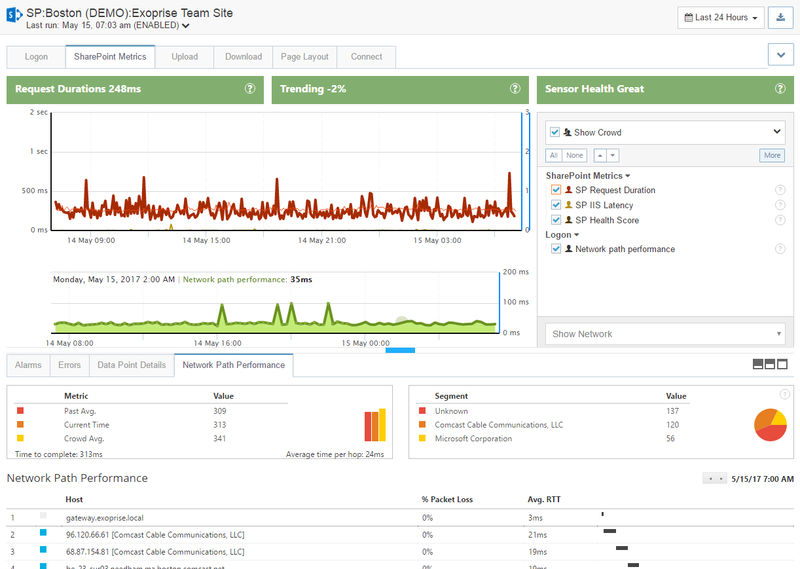 Simple Setup & Maintenance – No scripting required, Exoprise maintains the actions that operate against SharePoint pages, securely and in a universal manner for consistency and crowd-sourcing network benchmarks. 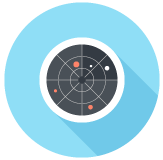 Crowd-Sourced Benchmarking – Only Exoprise CloudReady enables you to benchmark your installation against other customers (anonymously and in aggregate). Know instantly whether your SharePoint tenant is slower than others. 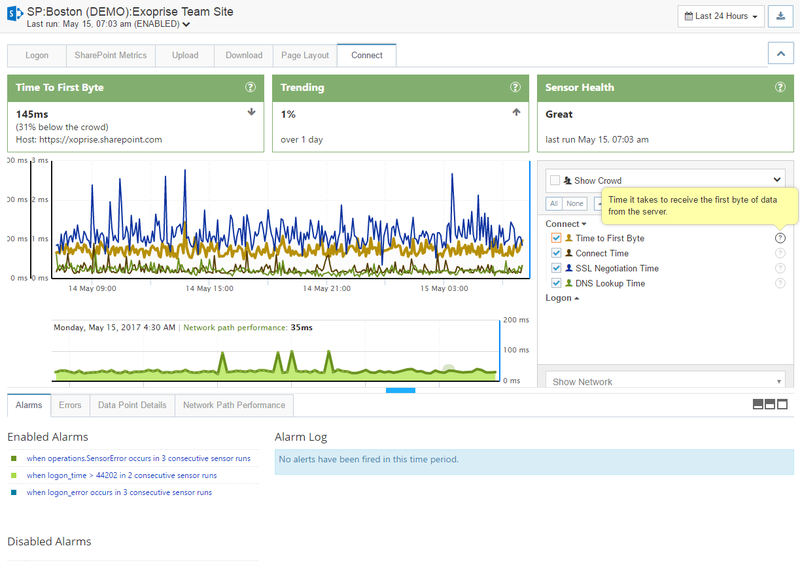 Correlate metrics across the Internet to understand where and when there is a SharePoint outage. With SharePoint, often used for corporate intranets and mission-critical team collaboration, access and control is protected by cloud-based or on-premises Single Sign-On (SSO). Measuring and monitoring performance is critical to access control for SharePoint. Login Time – For all SharePoint sensors, Logon Time is captured as part of the overall login procedure. Initial Page Time – This value represents the initial page loading time including all redirects through front-end authorization. Proxy Connect Time – CloudReady Sensors installed behind proxy servers, either on-premise proxy servers or cloud-based like ZScaler, measure the proxy connection time for advanced warnings about potential outages and slow downs. Managed Logon Time – Managed logon performance versus Federated logon performance depending on sensor account configuration. Your Single Sign-On infrastructure is continuously monitored for uptime and performance. Federated Logon Time – Federated logon performance is often difficult to measure because of the many redirections and cross-server telemetry. CloudReady helps you determine the bottlenecks of your SSO clusters and providers. As part of each synthetic SharePoint or OneDrive sensor run, SharePoint and IIS specific counters are captured, recorded and aggregated. Benchmark and compare your SharePoint performance, outages and errors against global and regional CloudReady crowd data. This assists in proactive outage detection and capacity planning. SharePoint Request Duration – An average for all of the SharePoint requests during the sensor run as reported by the Internet Information Services (IIS) web server. SharePoint IIS Latency– An average for all of the latency measurements between the IIS server and the SharePoint server for all of the requests for this Sensor Run. This value can indicate an under-performing SharePoint Online installation. SharePoint Health Scores– The health score reveals the health of the underlying SharePoint servers. 0 is healthy and 10 is unhealthy. The score is calculated using many parameters such as memory usage, concurrent requests and processor utilization. CloudReady SharePoint Sensor emulate users uploading and downloading files for network and server performance testing. Collections and document library can be specified in addition to testing SharePoint search performance. Upload Time – This value is the duration, in milliseconds, of how long it takes to upload a 420k (average size of an office document) file to the SharePoint collection. Download Time – How long it takes to download the uploaded file from SharePoint measuring latency, bandwidth and access times. DOM Loading Time – The time between the initial request and the point when the response has been parsed and the DOM/page is loaded. Initial Page Layout Time – The time between the initial request and the point when the response has been parsed and displayed, but before any DOM manipulations. Typically, pages that have dynamic content will require further page manipulation before the page is fully responsive and ready to be interacted with. Each connection to SharePoint and the underlying IIS servers is recorded for low-level timings such as Connect, SSL Negotiate and Time-to-First-Byte. 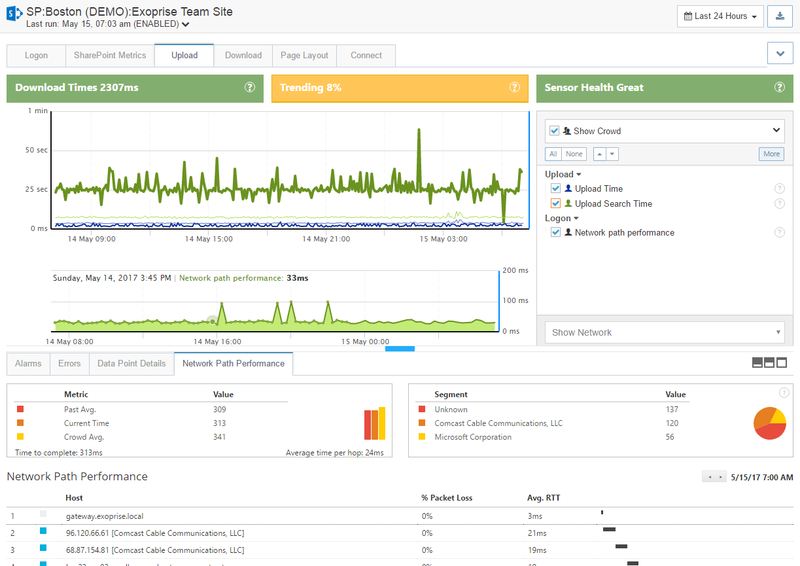 Captured metrics aide in troubleshooting poor SharePoint network performance, proxy servers and connectivity problems. The metrics are aggregated over 90 days for long-term network trends. 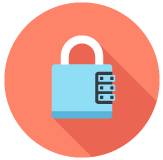 SSL Negotiate – Time it takes to handshake and perform the Secure Sockets Layer negotiation for the connection. This is the most network intensive of a connection to the SharePoint servers and will be affected by a slower (higher latency) network. Time to First Byte (TTFB) – TTFB is a critical measure of how overloaded IIS and SharePoint servers may be in processing and serving up content from Office 365. 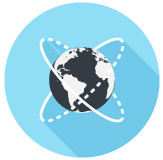 DNS Lookup – Host name resolution is measured for each part of the SharePoint page that is built up off of content from different servers and CDN networks. Know whether the problem is yours, your ISP’s, the Internets or everyone’s. We call it Crowd-Powered. Come join us! Subscribe to our weekly Cloud Health Report to see how Office 365 performed last week. Measured from 1000’s of locations throughout the world – its legit. 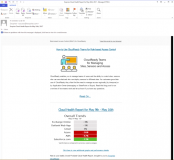 Download the CloudReady SharePoint Monitoring Datasheet for more information. Share it with your fellow engineers. Each CloudReady sensor has its own set of requirements and configuration. 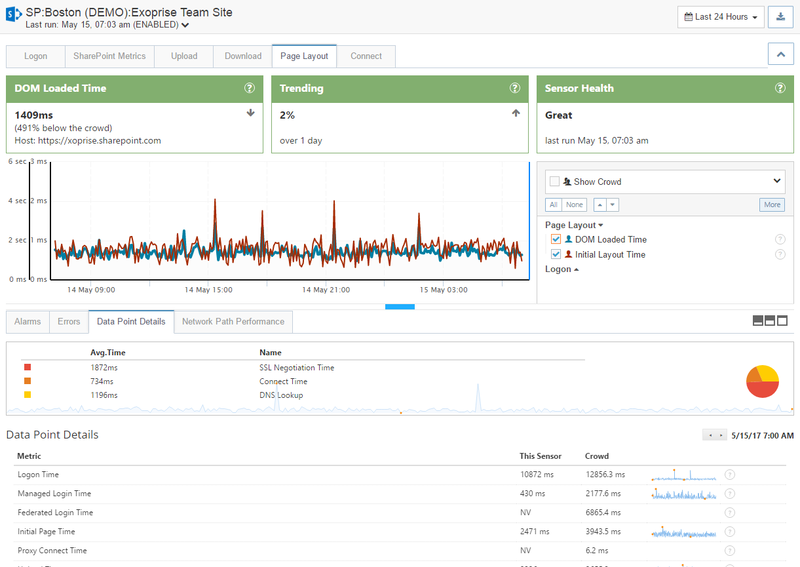 Using the Exoprise Management Client, customers configure and validate before deployment to a single or multiple sites. Our guided setup wizards guarantee an easy and successful deployment.